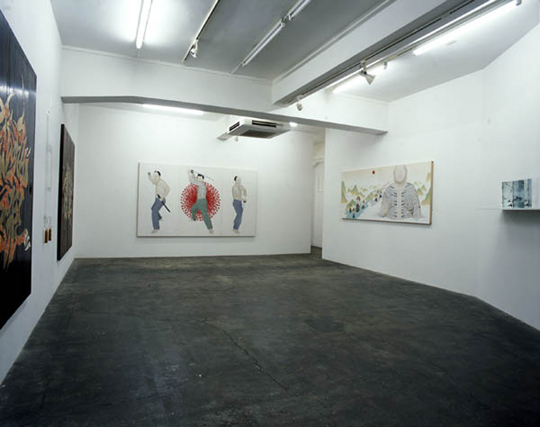 The year 2006 for Tenmyouya has started off with his first exhibition at the domestic art museum: the Museum of Contemporary Art Tokyo “MOT Annual 2006: NO BORDER- From ‘Japanese Paintingﾕ’ to ‘Japanese Painting'”. Thereafter, there were Official Art Poster 2006 FIFA World Cup Germany, release of his documentary film from the near equal series ‘≒ Tenmyouya Hisashi’, a group exhibition “Berlin-Tokyo/Tokyo-Berlin” at New National Gallery in Berlin, and publication of his third catalogue ‘TENMYOUYA HISASHI’. He has become one of the most remarkable artists who keep delighting our eyes with his dynamic activities. The exhibition will contain new works. 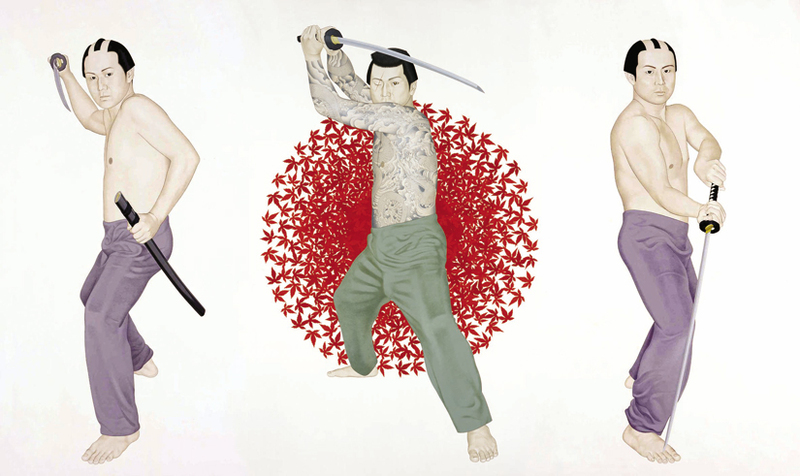 A large scale painting with three samurais stand against the Japanese flag depicted with autumn leaves titled “Made in Japan” will be its central piece. Other works are tattooed Amitabha of “San-etsu Amitabha”,and colored version of “Transparent Scroll”. As Tenmyouya says, “Being born and raised in Japan, I am proud of Japanese culture and identity. In order to survive in the international art scene, I believe the unique Japanese aesthetic and culture that doesnﾕt exist in the western context can be a great weapon, ” the stance he takes is fully conscious of being neither a stylish culture nor oversea stereotyped traditional Japanese caused from a rapid internationalization and integration of cultures, but keenly conspicuous “Japanese artist’s work that transcend autochthony, and transmitted to the world from Japan”. By calling himself “Buto-ha” who fights with his paintbrush to throw off the ready-made concept, he quest for the real meaning of “Made in Japan” raising this questions to the audiences. (*2) A word used to describe a person who has a desire not to remain within secure constraint of the orthodox but to seek change. It derives from a word “kabuku”, to behave as one pleases or wear blatant out fit ” (Kojien) is also etymology of the traditional Japanese theater “Kabuki”.